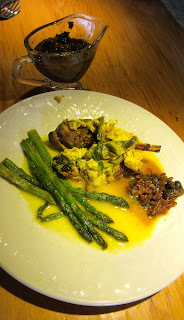 Medieval Spanish Chef: LEGÚSTO WITH ROMAN LOVAGE SAUCE RECIPE CALLED "HYMPOTRIMMA"
LEGÚSTO WITH ROMAN LOVAGE SAUCE RECIPE CALLED "HYMPOTRIMMA"
L. Levisticola visticum officinale, Eng lovage. This is a common ingredient in the Roman and Sephardic versions of almodrote. HYMPOTRIMMA ADAPTED FROM APICIUS/FLOWER CH I:XIX:1:59 HYMPOTRIMMA. Boil grape juice until reduced to ⅔ the volume. Grind the pepper and chop the remaining solid ingredients. Put all the ingredients, except the mint, in a saucepan. Bring to a boil. Just before servicing add the mint. A curious title as hypontremia means abnormally low level of sodium in the blood. This is associated with dehydration. 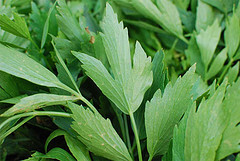 Celery leaves were used as lovage was not available. Fresh, newly made cheese such as cottage or cream cheese. See blog titled almorí published August 26, 2011 for explanation. As it is so complicated a bouillon cube was used.